I’ll be honest. I had never heard of Yalda until I was asked to write this article. The only lead that I got about the festival was from FEZANA’s editor who mentioned that pomegranates form an important part of the festivities. I was surely intrigued and went to my trusty encyclopaedia, Google to learn more. What I learnt surprised me. Yes, Yalda – which falls on December 21 – is the celebration of the winter solstice but it is also the oldest Persian festival. Yes, like most Parsi festivals it involves copious amounts of food but it is also celebrated as the victory of light over darkness since daylight hours get longer than the dark past the solstice. But what does the pomegranate have to do with any of this? I already knew part of the answer to this puzzle. The pomegranate holds a sacred position in Zoroastrianism and you will find it as part of the offerings on a Navruz table, at a Jashan and also during prayers for the departed souls. This is because the purple outer covering of a pomegranate symbolizes birth or dawn, and their bright red seeds the glow of life. However, the fruit is closely linked to Yalda also because our ancestors believed that by eating summer fruits like pomegranate and watermelon on this day, they wouldn’t fall ill during the winter. 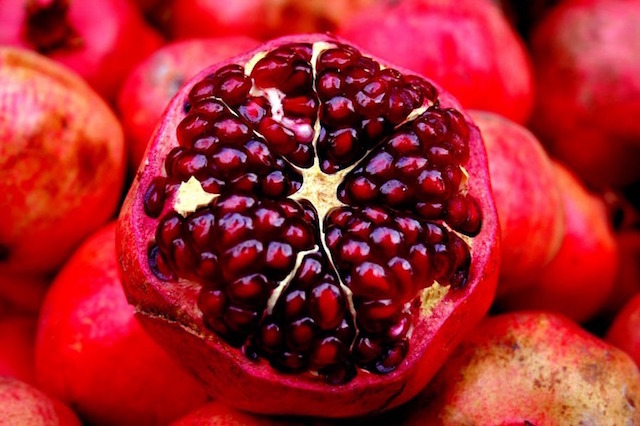 I’ll remember to eat a pomegranate this winter I think instead of taking the dreaded flu shot! One of the ancient traditions with the Yalda festival is to exchange gift baskets of summer fruits with your loved ones as it is also an occasion that marks the end of the crop season. 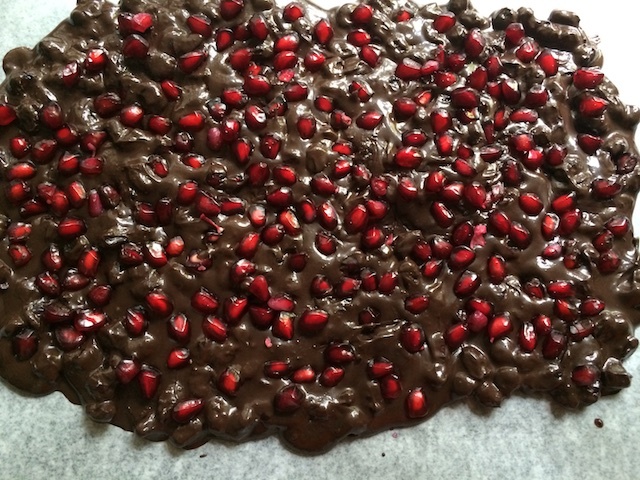 I don’t think BawaGroom would take kindly to me gifting him a basket of watermelons and pomegranates so I decided to improvise and combine the pomegranates with his favourite ingredient – chocolate – to make a Dark Chocolate Pomegranate Bark. 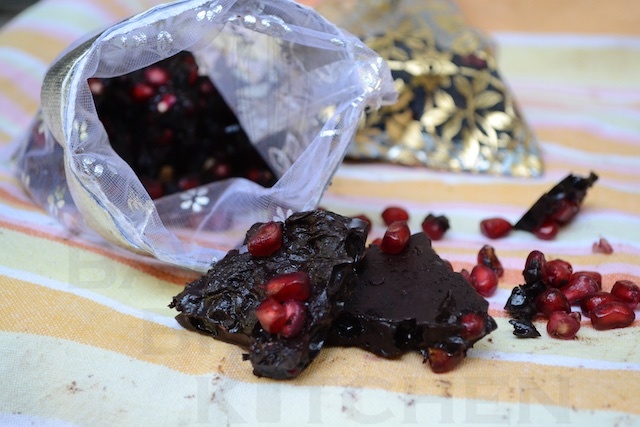 The recipe is really simple so I hope you enjoy making it for Yalda this year. Line a metal baking tray with baking paper and pour the melted chocolate onto the tray forming a longish rectangle. Don’t make the chocolate layer too thick! You can also use this combination to make chocolates if you have chocolate moulds at home.